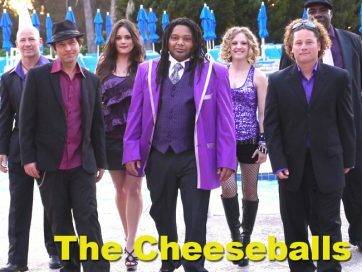 The Cheeseballs are San Francisco's premier high energy dance band with thousands of successful shows under their belt. Groovy, funky and at the top of the list of go-to bands for special events of all nature, The Cheeseballs have delighted tens of thousands of fans across the country including the biggest names in corporate party event production. From 70's disco hits to 80's new wave and rock classics, along with current hits (Robin Thicke, Pharrell, Pitbull, Katie Perry, Ke$ha, Lorde). From "Stayin' Alive" to "Royals" with a bit of Etta James "At Last" thrown in for the first dance. The Cheeseballs are the in-demand Party Act for weddings, company parties and fundraisers across the country and have performed for a wide variety of clients from small tech start-ups to Fortune 500 firms while leaving every single one of their begging for even more! From small wine country weddings to the largest of special events, we are pleased to assist you in planning a memorable occasion. The Cheeseballs have also performed in Mexico, Hawaii, the East Coast and beyond for large public events, private parties and capacity-filled dance clubs.